Bolivia's Jesuit Missions, Santa Cruz Grows Green, and What's Your Reason to Believe in a Better World? Does our E-zine look strange in your email? Read it online here. This month Alison visited San Javier and Concepción, two of Bolivia's numerous Jesuit Mission towns, and came back with a question: why don't more people visit this area? The Jesuit Missions of Bolivia do have a truly unique history. 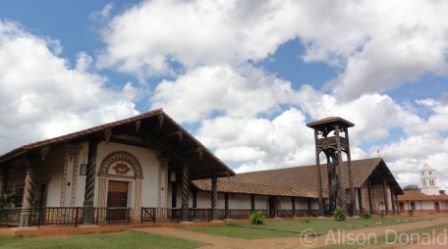 Unlike Jesuit Missions in other countries such as Paraguay and Brazil, these towns, located in the vast Chiquitania region of Northern Santa Cruz and some portions of the state of Beni, are not just interesting archeological ruins. Bolivia's Jesuit Missions are living remnants of the country's colonial and post-colonial period. What is perhaps most fascinating about them, is the history of their immense and elaborately ornate temples; however, the region itself is beautiful too. Also this month, Alison interviewed Rhea Borda, former US consular agent for Santa Cruz, and founder of the Jessika Borda Foundation for Assistance to Victims of Crime. Check out our featured recipe and restaurant review, travel tips, Bolivia trivia, plus learn about 5 awesome but lesser known tourist attractions in Bolivia. And finally, June 5th is World Environment Day. Read about how BoliviaBella.com and the Santa Cruz State Government are working together to create environmental awareness. Readers: what are some of your favorite tourist attractions in Bolivia? Share your Bolivia travel story here. Readers: have you ever volunteered your time in Bolivia? Share your most touching volunteer moments here. Readers: Who serves the best or worst food in Bolivia? Add your own Bolivian restaurant review here. June Bolivian Recipe: Pique Macho (Pique a lo Macho)! Readers: Did you know you can add your favorite Bolivian recipes to our website no matter where you live? Share your favorite recipes in English here - Comparta sus favoritas recetas bolivianas en español aquí. June Bolivia Travel Safety Tip! Readers: if you’ve traveled Bolivia we’d like to hear how you stayed safe while traveling, or any other suggestions and recommendations you have about traveling Bolivia. Share your helpful Bolivia travel tips here. June Upcoming Events, Holidays and Festivities! June 5 is World Environment Day and the United Nations has also declared 2011 International Year of Forests. Bolivia is a heavily forested country and our national government has also indicated its concern for environmental protection. Here in Santa Cruz, where we are based, the environment is suffering. So together with the Autonomous Government of the State of Santa Cruz, BoliviaBella.com will be making numerous efforts to create more awareness about the urgent need to take care our environment, use our resources with care, and keep our cities clean. Santa Cruz is looking for ways to become a greener city and state. Read more about the voluntary environmental education alliance we’ve formed called Santa Cruz Crece Verde (in Spanish) and Santa Cruz Grows Green in English and our special feature on Bolivia’s forests. June 6 Dia del Maestro (Teacher’s Day). Children honor their teachers with small gifts and by singing to them or reciting poems. Schools make sure there are a lot of activities to honor teachers. Commemorates the founding of the first School for Teachers in 1909 in Bolivia’s capital city of Sucre. Some schools close for the day. June 23 San Juan is celebrated in Bolivia every year on 23 June and is said to be the shortest night of the year. It is also the coldest night of the year.... read more about San Juan. More June Festivals and June Special Occasions. Click here to see announcements of Events in Bolivia you won’t want to miss in English or our list of Eventos en Bolivia en español. You can also add your own event announcements – free – on either of these pages. June Special Kids Feature: Traditional Bolivian Games! Readers: Bolivia for Kids is a special sections that enables kids, teens and teachers to find information on Bolivia easily, for school reports and classroom projects. It is the largest collection of information on Bolivia available specifically for students and teachers. Share Bolivia for Kids with your local school. June Bolivia Trivia: What’s the secret to haggling prices in Bolivia? When is it and when isn't it appropriate to bargain or haggle on prices in Bolivia? We've actually posted a short lesson on how to haggle in Bolivia and it's hilarious! Find out how to get a bargain in Bolivia. Readers: Do you know something about Bolivia that you think other may find unusual, interesting, or just plain surprising? Share your own Bolivia Trivia here. June Travel Deals: Who’ve thought Tuesdays were a good day to travel! From Travelocity: Thank Goodness It's Tuesday: Save up to 45% on Hotels and Vacations Every Tuesday until Midnight! June Forum Feature: Check out our new forum for bikers! Bolivian age requirements for motorcycling? Bicycle tours that aren’t on Death Road? Where to buy motorcycles in Bolivia? These are some of the questions coming in through our rather new forum for bikers! Take a look! June Expat Meet: Sign up to get invited! Through our BoliviaBella Expat Services division, we offer many services that are helpful to incoming expats in Santa Cruz. One of these is a monthly Expat Meet which we organize in Santa Cruz so you can meet other foreigners (from many countries) or make new friends. This is an especially great opportunity if you’ve just moved to Bolivia and don’t yet know many people. It’s family friendly, fun and we visit a different place each month. If you’d like to be included on our secure mailing list, click here and sign up to receive invitations. Readers: I’d like to remind you that you can also visit my other website www.GoSouthExpat.com. It’s an online forum community exclusively for expatriates in South America. Be sure to enter our Reading Rooms where you’ll find hundreds of articles on making the best of your life overseas. One of our new Bella News E-zine features is our “Ask Bella” section. We get a lot of email and questions in our forums – more than we can handle sometimes - and we can’t answer them all personally. So we’re now giving you the opportunity to ask your questions on this special page. We'll feature the response to one Reader question in each of our monthly newsletters. Have you got a nagging question about Bolivia that you just can't find the answer to? Click here to Ask Bella! Someone recently asked me about new or unusual tourist attractions in Bolivia. Some of Bolivia’s tourist attractions are promoted to death, while others receive scant mention, even though they may be just as archeologically interesting or historically important as others. And while they may not be new attractions, there are a lot of beautiful places in Bolivia that just aren’t well known. Read about 5 awesome but lesser known tourist attractions in Bolivia. Readers: Do you have experience obtaining a tourist or specific purpose visa to Bolivia? Share the wealth! There are dozens of questions in our Bolivia Visa Forum from nervous travelers who would love your help! June “Ask Chef Noly”: Wacataya Wednesdays! Chef Noly visits BoliviaBella and posts Bolivian recipes and interesting articles about Bolivian culture each month on Wacataya Wednesdays! It all began when a frustrated reader wrote in about his awful Bolivian cooking experience! Looking back, of course, it’s actually quite hilarious! Click here to see how Wacataya Wednesdays got started. Do you have questions about Bolivian food? Ask Chef Noly! You can also share your own recipes! I’m trying to find a recipe for a dish that an old friend from Bolivia used to make. She called it a “torte/torta”... Do you know the answer? The Message Board is where I post messages about things I think you might be interested in throughout the month. Anything goes as long as it’s useful! Check it out daily – things change here quickly. You can also subscribe to my blog to get updates each and every time I add or modify a page. It’s the best way to stay informed between issues of this Ezine! You'll find interesting news, great flight deals, reviews of new books about Bolivia, highlighted articles, and anything else that's useful to Bolivia tourists and expats. Bella Store is a great place to shop for South American gifts and Bolivian souvenirs all year long. Shop for alpaca sweaters, Andean handicrafts, leather, ceramics, arts, souvenirs and more. Bella Store is a National Geographic and Novica affiliate. When you Shop the National Geographic Store! All purchases support research, education, conservation, and exploration.